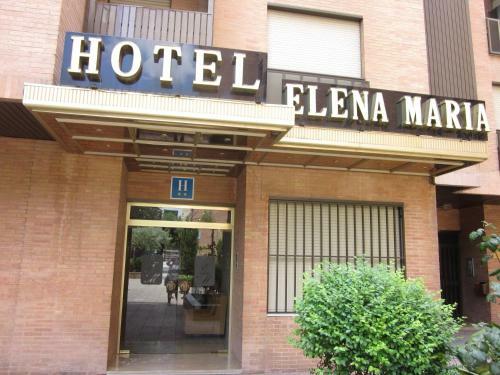 The city-centre Hotel Elena María is located in one of the main streets, allowing easy access to many impressive historic sights and bustling tapas bars. The hotel has its own bar. WiFi is available in all areas and is free of charge. Private parking is available on site (reservation is not needed) and costs EUR 10.10 per day. Designated Smoking Area, Air Conditioning, Heating, Safe, Facilities for Disabled Guests, Non-smoking Rooms, Newspapers. Located close to the fountains of the Jardines de Triunfo and the university’s historic HQ behind, this modern hotel is a 20-minute walk from the Moorish splendour of the Alhambra. Local transport links are convenient, with the train station only 300 m away and a number of bus routes passing outside. This hotel is 2565 metres from the Alhambra entrance, 1533 metres from Plaza Nueva (the absolute centre of Granada), 232 metres from the train station and 1563 metres from the bus station.